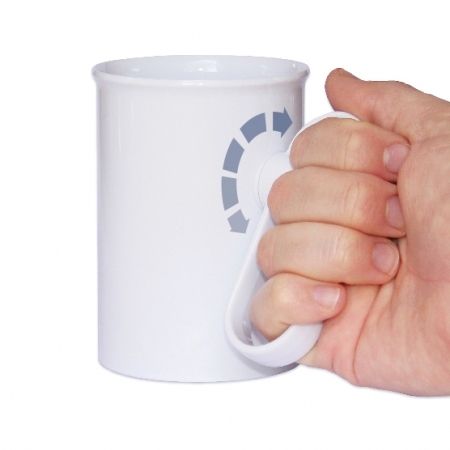 The handSteady Cup with rotatable handle is ideal for people with poor grip and limited dexterity, perhaps as a result of arthritis or the tremor that comes with Parkinson’s Disease. The cup’s unique design makes drinking easier with more control, more comfort and fewer spills. Made from durable, lightweight plastic, the cup looks like bone china. It has a large handle for 4 fingers which rotates so that that the cup self-levels using gravity, tilts easily and keeps steady even with a tremor (with the handle upside down or at 90 degrees the effect of tremor can be less). To drink from the cup, lift the handSteady in one hand by holding the extra-large easy grip handle and use the other hand to nudge the cup so that it swivels on the handle. This allows the user to hold the cup and take a sip in the most comfortable position without needing to twist their wrist, raise their elbow or tip their head back to drink. To minimise spills, handSteady also comes with a discreet hidden lid that contains a small drink and straw hole. The cup is dishwasher proof and microwave safe. Makes drinking easier with fewer spills. Ideal for people with poor grip, limited dexterity and tremor. Extra large, easy grip rotatable handle. Discreet lid with drink and straw hole. Dishwasher proof and microwave safe.